In this article, we have outlined the best strategies for Clash of Clans to attack opponents with numerous tips. In this case, this attack guide is for beginners as well as for advanced players. Clash of Clans is not just a matter of neat build his settlement and to defend but also to attack enemy villages. Who wants to play Clash of Clans effectively, should proceed with the proper attack tactics in the fight. How you do it the best way and how you better shall not make it, you will find here. What troops should I take for a fight in Clash of Clans? The troops selection is again left entirely to the players themselves. First, you should re-thinking do you need, resources or trophies? When resources are needed you should have plenty of goblins and archers in the luggage. As these are usually stay outside in Clash of Clans, you do not necessarily need giants for the destruction of guns, air launchers etc., because you can not be detected directly by these. If not necessarily focused on the trophies, it is enough if you have these two variants of troops. Some barbarians be useful too, in the battle. At the trophy hunting you rather aim the town hall, which usually stands at the center of the village at Clash of Clans. You should have giants and mostly a lot of wall breaker going into the battle for defense and wall destruction. Archers and barbarians can support the fight quietly in addition. For more tips on Attacks in Clash of Clans we have also advanced tips in the next chapter. What should I know about the opponent search? Now we want to give you some tips on how you should choose your opponents in Clash of Clans. When choosing opponents you should always pay attention how pronounced and built the enemy village is. Also you should test with an archer or barbarian, whether donated forces are represented in the enemy castle. Is the village of the enemy built with a better defense than your own, you should keep in mind that the battle in Clash of Clans might not achieve victory. A further point of note: is the town hall outside of the base or in the middle? If the town hall stands in the middle of the base of the enemy, he wants to achieve with it, that he wants to protect his trophies. In the middle the town hall is better protected and it is difficult to attack the town hall. Is it fully protected with cannons, archer towers, mine throwers etc. your attack should provide difficulties. This village version is advisable for a resource hunting. If it is the other way around and the town hall of the opponent standing outside, his elixir and resources like gold must be important for him. He has his gold storage etc. in the middle of the base, so they are better protected against attacks. In this village variant of Clash of Clans you quickly earn trophies and is therefore worth considering for a trophy hunt. Strategies for attacks in Clash of Clans stagger always in level and also in trophy number. If you still fairly stay at the beginning, these tactics are should bring you a step forward. How do you attack your enemy village as a beginner in the best way, I present to you here a few advisable beginner strategies. The 4 directions Attack: For this strategy in Clash of Clans 6 wall breaker, 4 giants, 15 goblins, 15 archers, 20 barbarians, 1 Lightning Spell & 1 balloon. First of all you destroy the walls that guard outside the outermost cannons with a wall breaker. If this is done, one should use 4 Giants and 5-6 barbarians behind this. After that blow up the walls in front of the outermost archer towers, this takes about 15 barbarians. Then it continues with the elixir storage, with these you do it the same way as with the previous things. At first break through the walls from the most extreme camps and then attack them with 15-20 archers. Then you take down the gold storage, this should also be free of walls and attacked with 15 goblins so that they then can plunder the camp freely. If you need Gold or Elixir for your village you focus directly on the Gold & Elixir storages and mines. This engages as best with plenty of goblins. Therefore, you should consider to rise the goblins a few levels for resource hunting in the laboratory. When this is done, the goblins are faster at clearing out the camp. You want to take the town hall of the opponent in Clash of Clans. If that’s the case, you should pull wall breakers into the battle with archers, giants & barbarians. The archers are used to protect the Giants and thus to destroy the defenses. The Barbarians are a little helper at the starting line. The purpose of the wall breakers as the name suggests, to destroy the walls, so the path is given free to the town hall. Depending on which level your barracks have, it would be advisable to integrate a wizard in formation with the troops. You attack, because you want to earn a few trophies and at the same time an increase in gold and elixir stock would not be bad? Then, the troop design left to your own. Of course you can pack with goblins for clearing out the gold and elixir storage. Likewise giants, archers, wizards, barbarians are possible to destroy the base of Clash of Clans. What happens if I do not win 3 stars (100%) in a fight? If you not win a fight in Clash of Clans by completing 100%, perhaps of a to good base defense or because of your not well thought selection of forces you may lose a fight. This is not so bad, you only lose in this incident unfortunately trophies. These are sometimes more and sometimes less. As advanced or professional one who has already dealt with Clash of Clans for a long time and know a little better what you should mainly note in an attack on an enemy village. Therefore we go again on a Clash of Clans Strategies and Tips for advanced. What should I consider as Intermediate in the opponent selection? On the opponent selection generally every Clash of Clans Players should pay attention to whether beginner or expert. If you do not look close enough at the base of the opponent, it is possible that you will lose the battle against the enemy. You should also consider if the opponents in Clash of Clans start a revenge attack, if your base will hold this. Also you should keep an eye on it to throw that the base is not so pronounced that it already seems like it is losing the battle against this village. A base should also comply with your troops level in Clash of Clans. The GoWiVa strategy: This strategy requires 16 wizards, 3 golems, 7 valkyries and 5 wall breaker, the number of troops can differ. The barbarian king and if available the archers Queen you should pick in the Clash of Clans fight. If you want, you can pick a few spells in the line-up, here 4 rage spells are advisable but of course the choice is entirely up to the player as well. First after a successful opponent selection, you should choose a location of the base, where the wall breakers are placed. After the wall breakers have successfully destroyed the walls in Clash of Clans, send your golems and wizards, it is the best to set a rage spell directly on them, also you should use this spell over again and over again. If these troops compilation has quite a bit damaged the base, you can use the valkyries & finally the heroes should be used. This attack strategy is mainly for advanced players in Clash of Clans with a higher number of trophies. For trophy hunting this tactic is very good. Farming tactic BAM: This Clash of Clans strategy should take 30 minions, 70 archers, 70 barbarians, a rage spell and two lightning spells in the attack. The heroes must also be involved and participate. First you should test whether clan castle troops are present, should this be the case, it is advisable to attract the clan castle and destroy them. After that you should destroy the outer buildings with barbarians. If that is done, take the archers and destroy the buildings behind the walls. With a minion you should search for air bombs and air defense at the base. The minions in the App Clash of Clans are generally used within the base to clear the gold/elixir storages. If the wizard towers have the minions in their sights, you should cast a lightning spell on the wizard towers, making it easier for the minions to attack. In between you should definitely support the troops with a rage spell. Finally, if you have sent all the troops on the base, the heroes should be used. 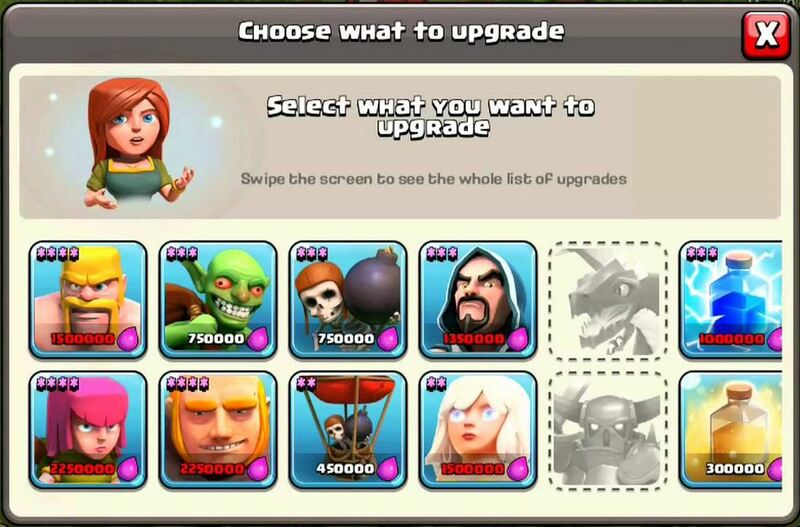 As an advanced player you should also make thoughts about the proper and good troop design in Clash of Clans. Attacking much stronger villages is hard, so level up your troops. The reason behind that it, that the troops do more damage to a village. For a fight you do not have time forever, so you should take care, that you progress fairly quickly with the troops. You can level up and improve the troops in the laboratory, like everything else that can be improved.